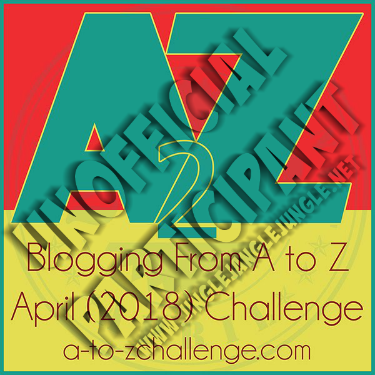 It’s time again for the annual A to Z Blogging challenge. I participated the past three years, and each year, I experienced a bit of blogging burnout afterward. Having seen quite a few really good bloggers disappear the past three years to their own ‘burnout’, I had decided that I would not participate in the challenge this year. But I am drawn to the challenge, like a moth to a flame. I choose to remain strong, so I’ve decided to UNOFFICIALLY participate in the challenge. That is… I will still do all of the letters, but will only be posting once a week. It is my hope that in doing this, that I will not suffer from the burnout that I have been seeing. 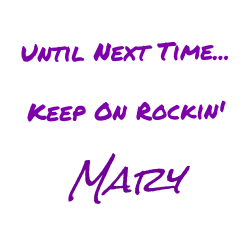 I decided my theme for this year’s AtoZ challenge would be Classic Rock. Here are this week’s letters and songs. You can listen to the playlist in the background as you visit other blogs participating in the challenge. Have a great week and Good Luck to all participating (officially or otherwise)! You are such a rebel, Mary! ☺ I love that about you. And you've chosen my favourite genre for your theme as well. We saw Edgar Winter last September in Toronto, opening for Alice Cooper and Deep Purple. What a talent! Of course, he did Frankenstein as his closing number. On the one hand, it's killing me not to be doing the A to Z Challenge, but on the other, I remember the long, gruelling hours and don't want to go there anymore. This is a great compromise. Maybe next year! We've lost so many great bloggers over the years. It just breaks my heart. Each year, I find myself posting less and less after each challenge. I am certain that by only posting once per week, I will not have the burnout. I still plan on visiting others as much as I can. Thanks for the continued support. Yes! This! So much this!! Love A, C and G and probably always will. Cat’s In the Cradle is perhaps my favorite up there! I definitely love Classic Rock! I strongly debated participating this year as well as I did not finish last year due to just not having it in me. But I have a strong sense of life upheaval going on and I felt the need to share that with the world. Also love the classic rock theme, all of these songs are fantastic. Thanks for stopping by Melissa Ann! I think this was the best compromise for me. It gives me the feeling of participation, without too much fear of burnout. I plan to be around for a long time. I've got some real good ones lined up this year. As per usual, I am running late in getting around to things. Enjoy your challenge! Great idea and great playlist!! Oh wow, love that song! Hubby has American Woman in one of their set lists too! Their singer really sings the hell out of it too! Thanks for posting a great tune! Have a rockin' day! I have to wonder if you are seeing an entire playlist here. For the past several weeks, I have posted several songs in each post, but each time you comment you state you like the singular song. Always the first song. You do know there are more songs in that list, right? Of course, I DO mention the entire list just above the videos. If you're not seeing that, I have to wonder if you are reading the post or just skimming it. I'm in good company, then. ~grin~ I decided to focus on my April prose writing challenge, instead. Be well! Nothing wrong with taking a moment to focus on yourself. I like what you did! I have never really engaged with music-related blogs before. It's pretty cool reading about the challenges (A to Z as well as blogger challenges) that you face. Burnout is definitely real! Sounds like a brilliant idea posting once a week! By the way,great playlist! Wow you know a lot about music and bands. I am not a music person. I just get LSS with the last song I've heard but if there's music or not, it doesn't really bother me. haha But the past few days, I have been listening to the music of Home Free. Soothes me.